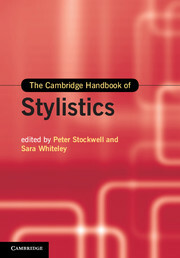 Twenty-five years ago, one of the contributors to the new Cambridge Handbook of Stylistics started a conference paper by declaring that there could not be a handbook for the field of stylistics. Unlike other subjects, went the argument, stylistics at the time did not have a commonly agreed set of methods and principles. Drawing on the most recent linguistics in order to study literature was seen as oddly interdisciplinary, and eclectic. The comment was quickly forgotten, as the speaker produced an overhead-projector transparency that was not only printed, rather than handwritten, but was actually in colour! There were audible gasps from around the room at this startling technology. Both the field of stylistics and the wizardry of our presentational skills have moved on equally exponentially since then. Stylistic methods that emphasise a systematic and modern linguistic understanding of the language of literary texts have become mainstream. The close description of literature can be found in literary studies all over the world. Twenty-five years ago, there was no such thing as a lectureship in stylistics: now a literary-linguistic training is almost a guarantee of an academic post. Exploring the language of literature is becoming central to the school curriculum. When literature students first encounter stylistics, I have watched the light of revelation dawn in their faces like an epiphany. Stylistics has itself changed, from being relatively narrowly focused just on the textuality of literary works to the current situation in which matters of reading, interpretation, culture and literary texture are prominent. Stylistics – under various different names across the world – has been supercharged by the revolutions in text-digitisation and in cognitive science. The Handbook of Stylistics would barely be recognisable to that audience a quarter of a century ago. Sara Whiteley and I assembled a stellar cast of the most important stylisticians of the age and asked them to produce something new. The result is a series of thirty-nine meditations, arguments and – of course – stylistic analyses. The Handbook is a monumental thing, both physically and intellectually, but it is also a starting point rather than a review of past glory. Stylistics is progressive, in the sense that there is a tangible collective desire to move the field forward rather than defending entrenched positions. Our authors set out their arguments and evidence as clearly and readably as possible, so that others can engage with them, and think about ways of addressing their ideas even better. Several of our chapters are even in the form of a dialogue between two authors. The whole thing is vibrant and exciting, and the aim of the book is to engage both the old stylistician and the new student of style in their own new thinking. We wanted thirty-nine chapters, rather than the rounded forty, to serve iconically as a suggestion that there is always one more thing to be said.